PATHS (Practicing Art through Hide & Seek) Windsor: Sign up Now for this September! PATHS (Practicing Art through Hide & Seek): A Project Series by Andrew Lochhead – Sign up and Participate! PATHS is part of an ongoing series of works and actions that explore notions of “play” as: an act of transgression, resistance, detournément, and subversion, a method of pedagogy, a means of investigating and exploring the urban environment & a means toward social engagement, in relation to the fine arts, – all within the context of our contemporary zeitgeist. 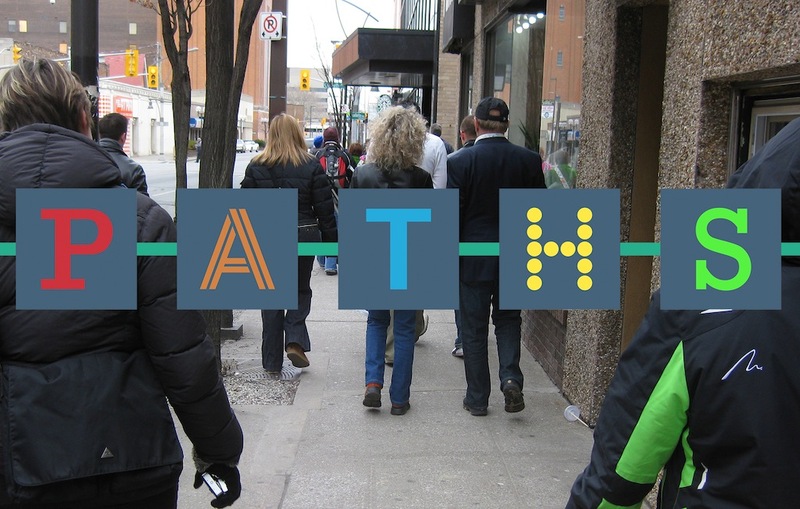 Led by artist Andrew Lochhead, PATHS will consist of 3 games held at 3 locations in Windsor on September 20th, 21st, and 22nd. Also, join us for a wrap party at 7pm at Villains Beastro on Sunday, September 22nd. The game represents a fun way of engaging with an aspect of our city of which many of us are unfamiliar. We hope you can make it out. Please use the form below to sign up for PATHS. Photography for Goods, a Skills for Good(s) workshop hosted by University of Windsor MFA Candidate Mike DiRisio, will cover ways to light and shoot objects to white out the photograph’s background – methods similar to those used in product photography. However, we will be using very basic materials, like desk lamps and large sheets of paper, so that you can easily reproduce this at home. We’ll then do some basic edits using Adobe Photoshop software, to completely white out the background and make the photographs as sharp as possible! Please bring a used object (preferably something no bigger than a microwave) to donate to the Common Goods freestore – we’ll be photographing these for the demo. 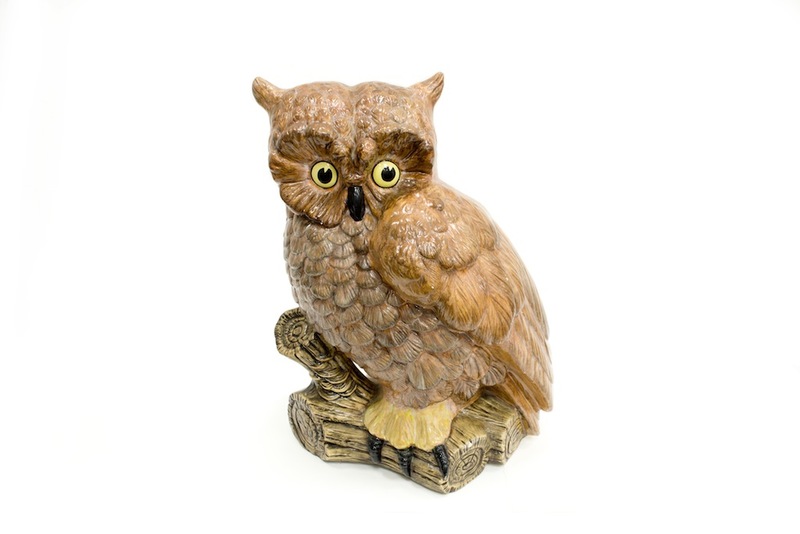 Please visit Common Goods to see examples of objects photographed this way, and to learn more about the project Common Goods. All are invited to join Alana Bartol, Program Coordinator for Neighbourhood Spaces, Windsor-Essex County’s NEW Artist in Residence Program on Wednesday, April 17th at 6:30pm at the Arts Council – Windsor & Region, to learn more about this exciting new initiative. 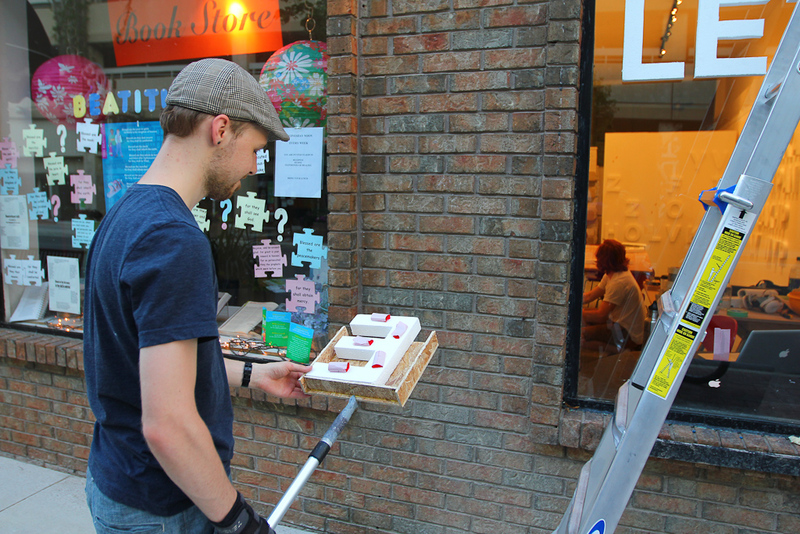 Neighbourhood Spaces: Windsor & Region Artist in Residence (AIR) Program is a new AIR Program that will locate ten chosen Canadian artists in community sites throughout Windsor and Essex County for 4-6 week residencies. 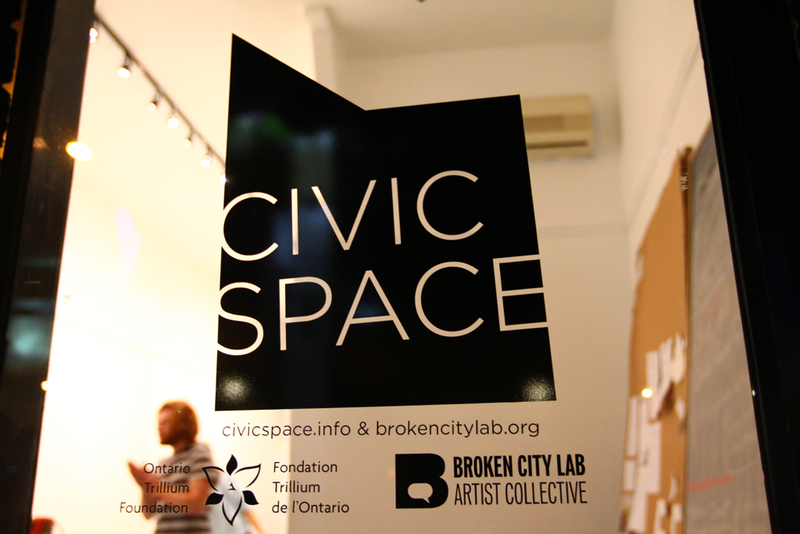 Supported by the Ontario Trillium Foundation, the program is a partnership of “the Collaborative”: Arts Council Windsor & Region (ACWR), Broken City Lab (BCL) and The City of Windsor. 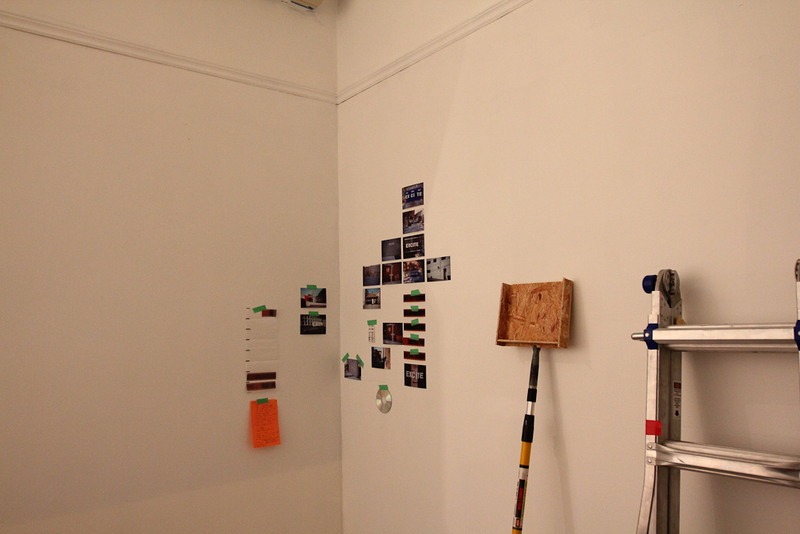 Neighbourhood Spaces (NS) is now accepting applications from Canadian artists of all disciplines including visual, performing, literary, music, interdisciplinary and media arts. 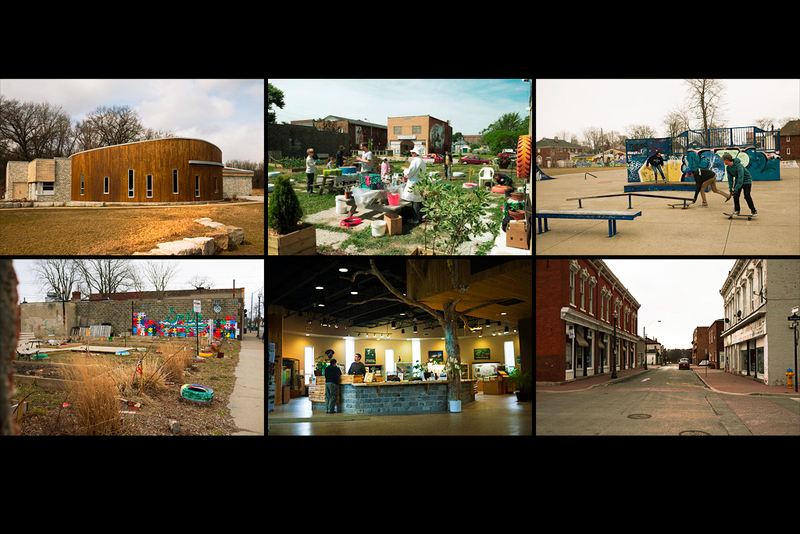 Neighbourhood Spaces will allow artists to work in non-traditional spaces in non-traditional ways, embedding artists in community sites such as parks, nature reserves, libraries, health or community centres. 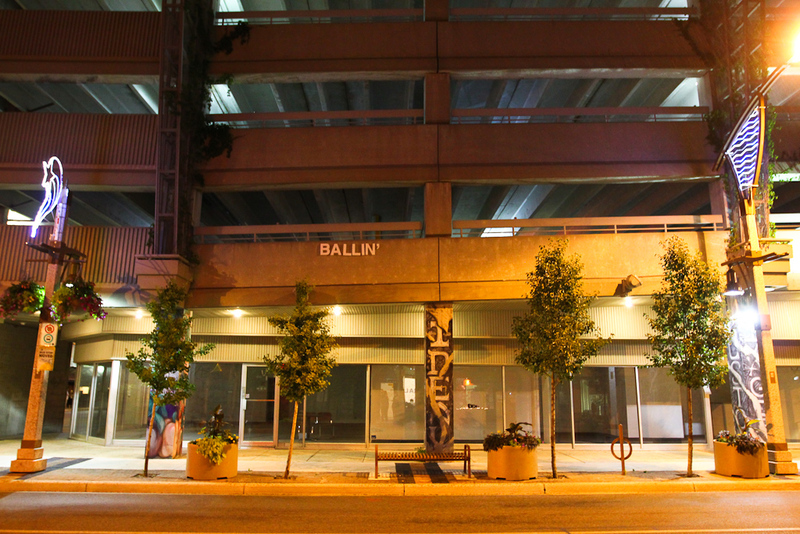 These sites will provide a “home base” for each artist to work during their residency, creating a compelling injection of culture into the surrounding neighbourhood. 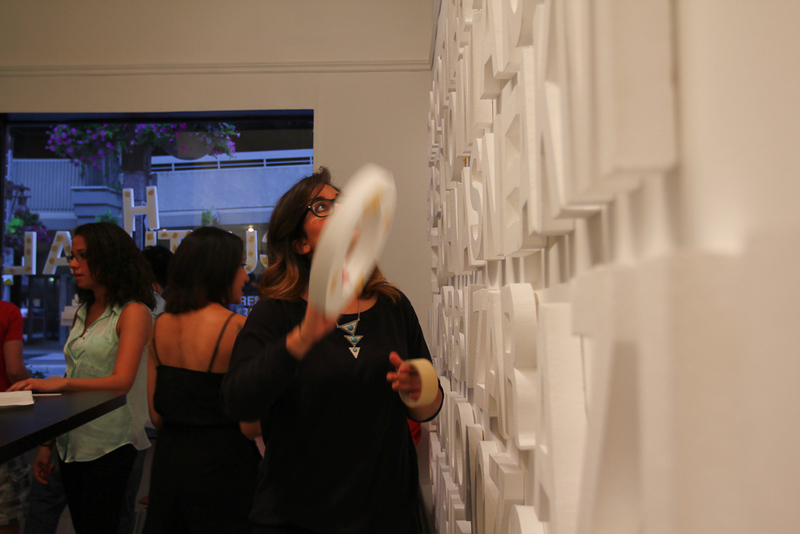 Artists will engage with communities and organizations, animating, inspiring and exploring the specific stories, curiosities, challenges and triumphs of the local community. Residencies will be 4-6 weeks, beginning in summer 2013 and will be staggered throughout the year, concluding in August 2014. A final exhibition and symposium will be held in the fall of 2014 and an online publication will be created documenting the program. Whether you are an artist that is interested in applying or a community site that is interested in participating, the event is free and open to anyone that is interested in learning more about Neighbourhood Spaces. All are welcome. 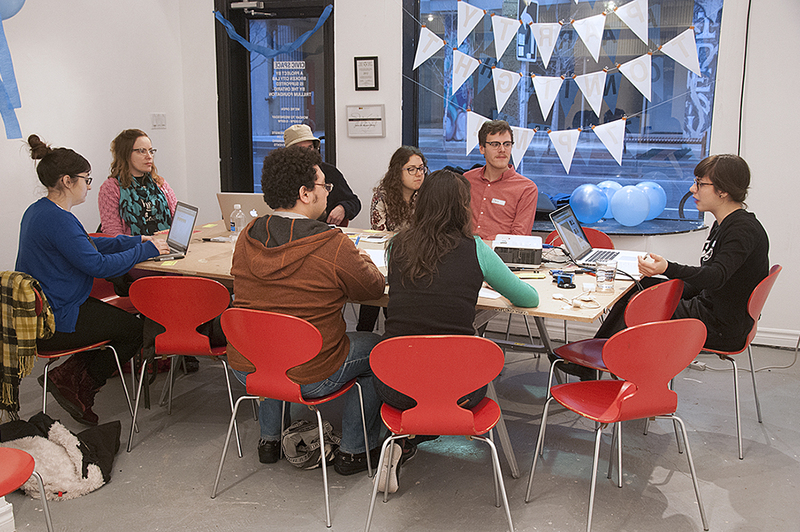 Last night was the first night of Blog Party, a biweekly get-together hosted by me and Josh. Blog party aims to bring bloggers in the Windsor and Detroit area together to discuss ideas, get inspiration, and learn about blogging in a collaborative environment. Since Blog Party is of course a party, we decorated accordingly. The first meeting was all about getting to know each other and discussing why we blog and what we can do with our blogs. As a collective, we agreed on a meeting format consisting of a 15-20 minute tutorial to begin each session, followed by group “studio time” where everyone can work on their blog with help from me, Josh, and the rest of the group. Everyone had a lot of really great advice about what does and doesn’t work in the blogging world. It will be really beneficial to receive advice and opinions from such a diverse range of people. We talked about what we want to see in tutorials; we’ll be covering information from how to take better photos and make web graphics to social networking and promoting your blog. At the end of the meeting we all crowded around my computer and did a show and tell of blogs we all liked. Everyone who came got a stamp on their membership card and was sent on their way. We plan on having accessible tutorials via Google Drive, just in case you miss a meeting. 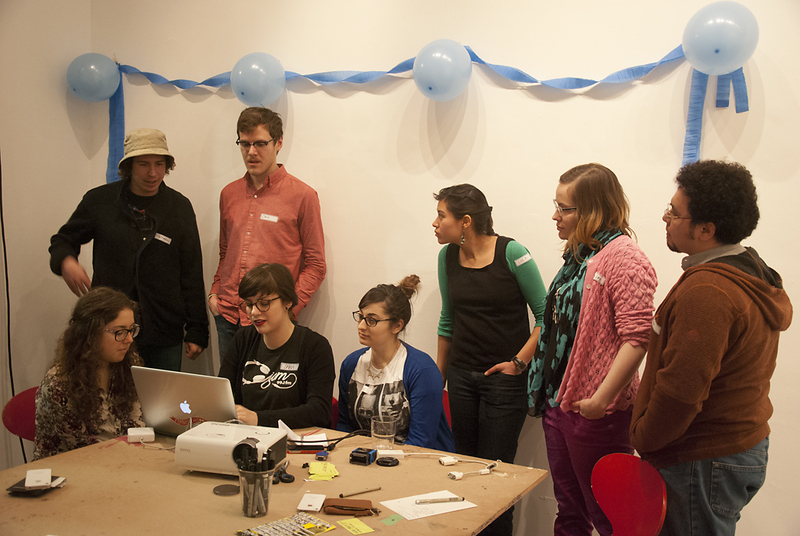 The next Blog Party is April 25, and even if you missed us yesterday, we hope you come! 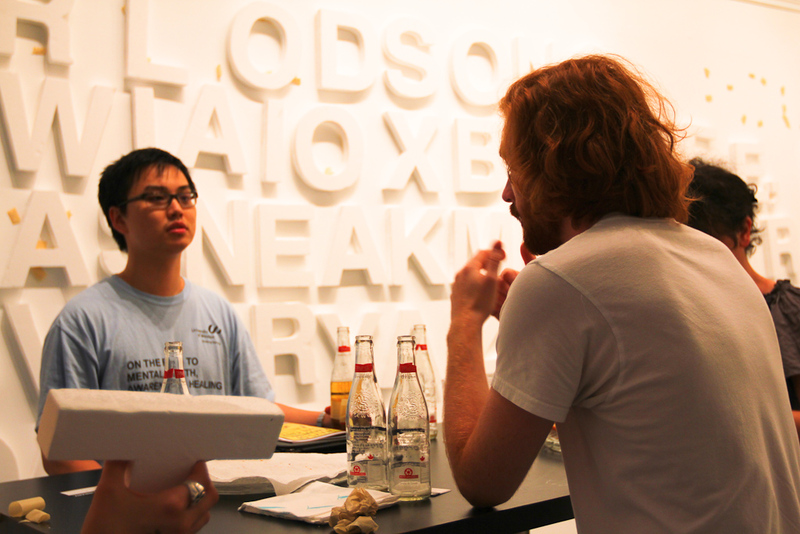 Tonight at 7pm at Civic Space, our open Electronics Workshops continue with host Paul Anderson. 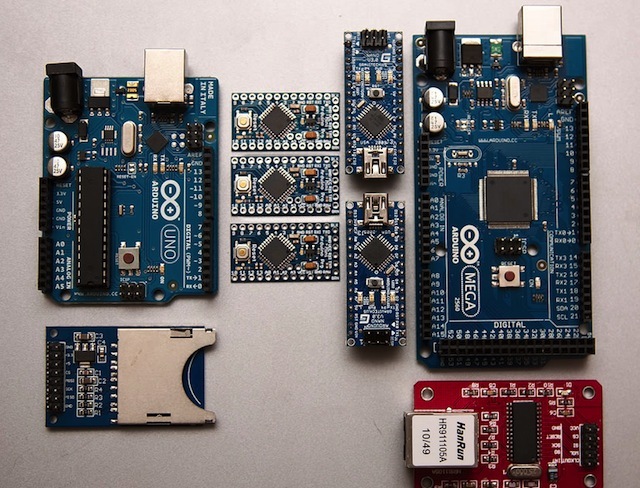 Tonight we are introducing and planning upcoming workshops with the Arduino, a popular single-board micro-controller used for a wide variety of tasks and projects. It’s free and open to all skill levels. Come nerd it up with artists and electronically-minded thinkers and doers. No registration required! 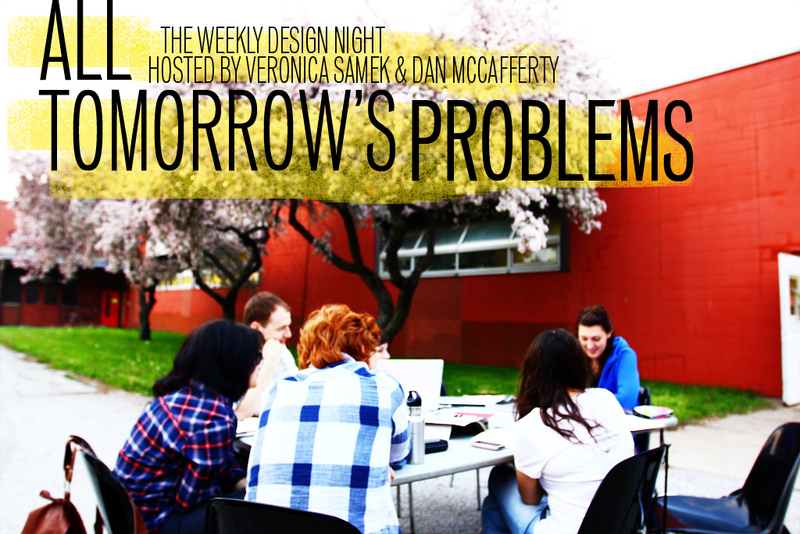 We’re hosting another round of All Tomorrow’s Problems (ATP), a weekly Design Night focused on creative and speculative problem solving.We’re going to kick things off by picking up where we left off in 2012, working through the future of local transit and mobility issues, and then moving onto other expansive and localized future-focused issues.ATP focuses on collaborative, Windsor-focused problem solving and project making, informed by weekly discussion and design nights. We’re looking for collaborative critical thinkers, problem solvers, and action-takers with an eye on the future of this city. 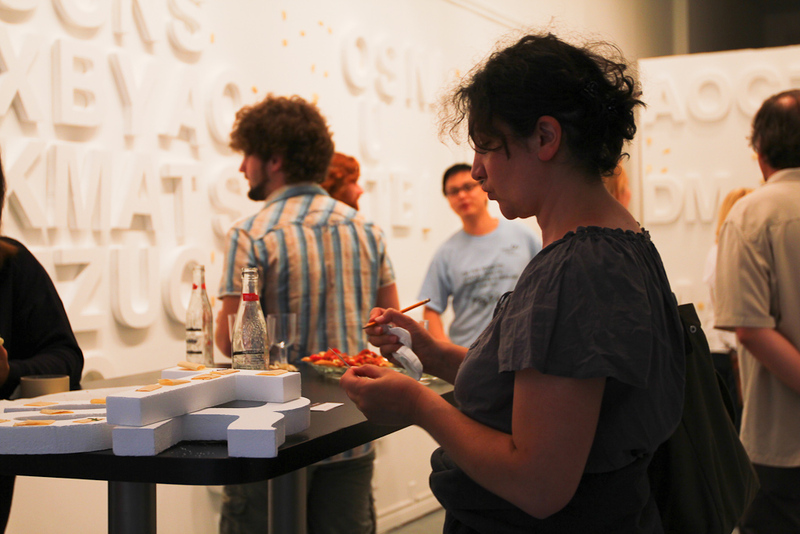 BCL’s Visiting Researchers/Designers Dan McCafferty and Veronica Samek will guide a 1–1.5-hour open studio every Monday, which will involve discussions, walks, field trips, rapid prototyping and wrap up with an exhibition, installation or beautiful intervention in the summer of 2013. Yes, it did. We had a great response and many inspiring ideas were developed during the first iteration of ATP, from September 2012–December 2012. 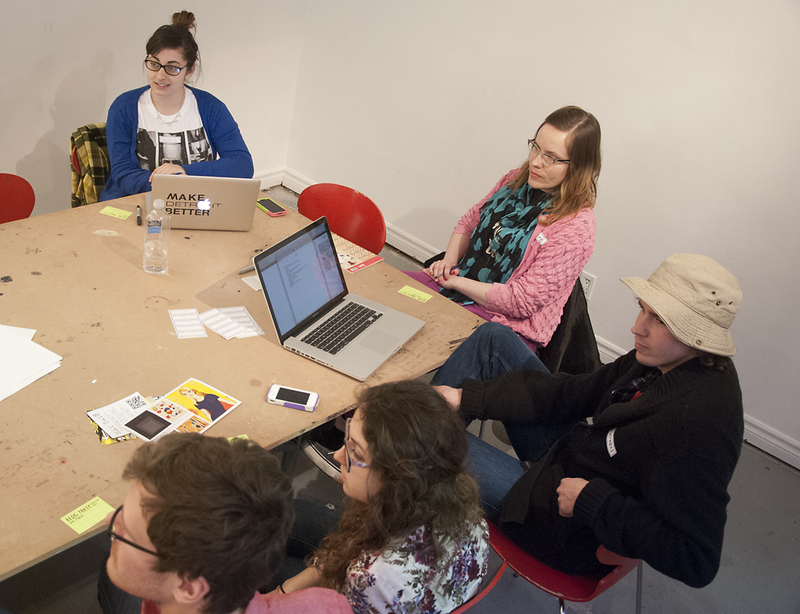 The Second / Spring installment (February–April 2013) will be focused on turning all that thinking and inspiration into action and tangible projects. We will focus on making things happen and projects that address our concerns. You know that the name of this is really similar to All Tomorrow’s Parties, right? Yes, absolutely. We appreciate the tone of that event and thought it was a nice way to reference doing things at a different scale. Do I have to be prepared to make art or design anything? Think of this as a very loosely organized place to discuss and exercise your ideas on a specific topic. We may not actually make something every night, but we will aim to creatively respond to the issue at hand. Ultimately, our thinking and discussions will materialize into something. Do I have to commit to attending every design night? We understand schedules change, so you are free to participate as your schedule allows. But YES… plan to attend as much as possible. Let’s make stuff happen. We need you at the table! Who are these people anyways? Long-time Windsor-Essex resident, Veronica Samek, first began her career journey unknowingly overseas. After graduating from the University of Windsor, she worked in England where she uncovered a passion for telling the Windsor-Essex story. Shortly thereafter, she returned to studying Journalism Print & New Media at St. Clair College and began helping others find their career paths as the Director of Communications for Workforce WindsorEssex. Through her work with this organization, Veronica is committed to a holistic approach to workforce development, emphasizing the importance of living, working and playing in a region with deep roots and a transformative pallet. Veronica is a member of the United Way GenNext Committee and a founding member of the Awesome Windsor-Essex Foundation. New to the Windsor area, Dan McCafferty identifies as a Winnipeger, though he has also called Ottawa, Halifax, Toronto, Chicago and Raleigh, “home.” Dan is a multi-disciplinary designer, artist and researcher who teaches Design in the Art and Art History Department at Wayne State University, in Detroit. 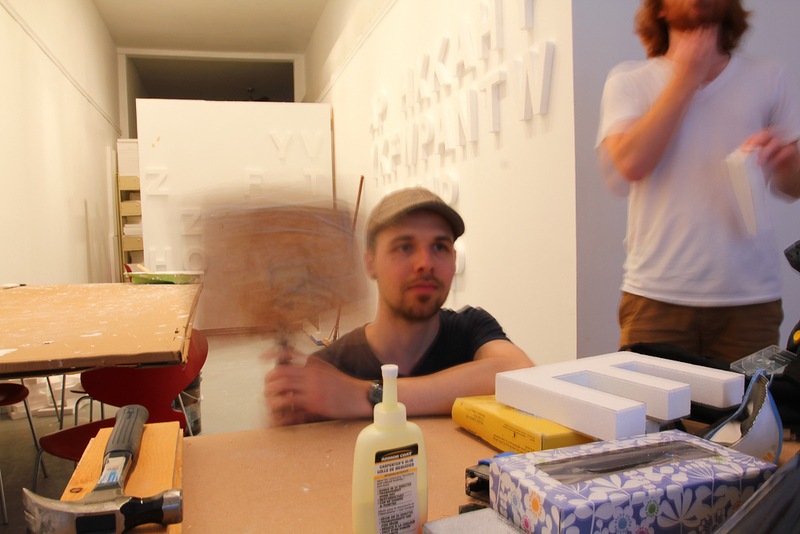 He co-founded the critical design collective Public Design Unit in 2011 and their first project, Parkdale Versions, was installed at Toronto’s Nuit Blanche. His interests include relational, critical and speculative art and design practices which are participatory, socially engaged and community oriented. We’re back to North Bay for our opening of Surviving North Bay at White Water Gallery. 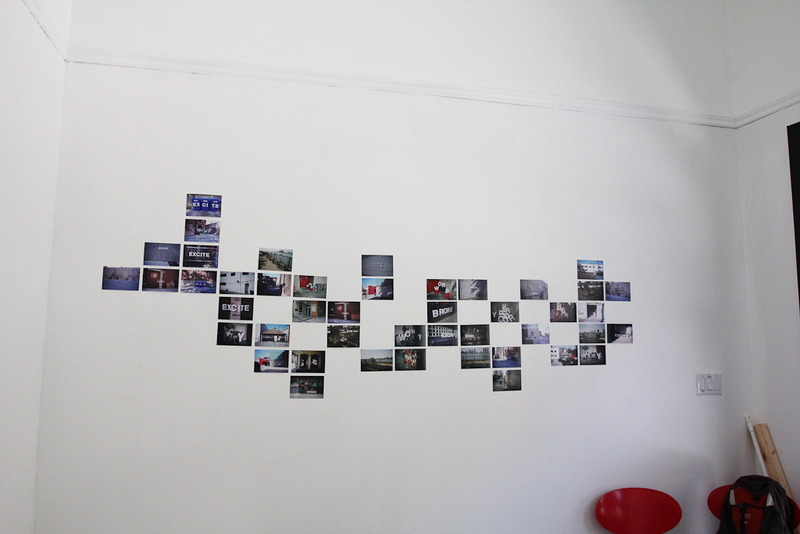 After concluding our research micro-residency this past summer we returned to Windsor to brainstorm ways to address the concerns that residents of North Bay brought up about the city. 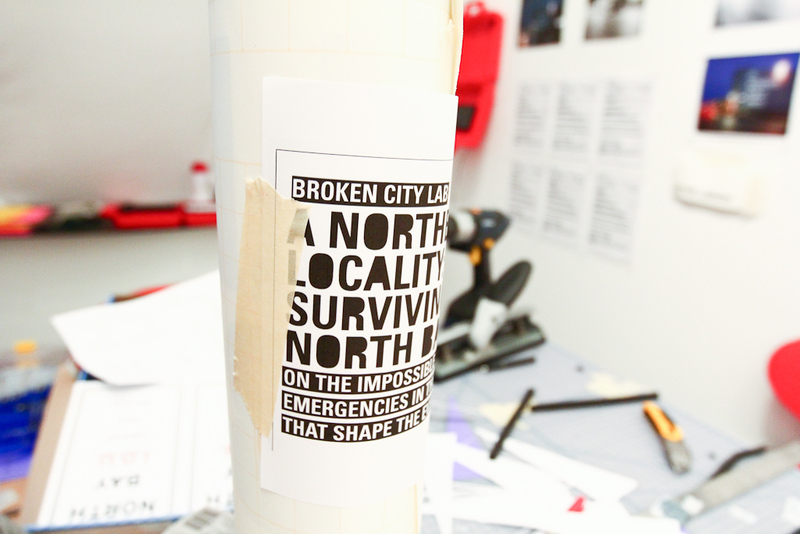 The result: a series of survival kits designed to help North Bay face whatever the future the city has in store. Each red plastic kit contains useful and unique items to artfully solve local problems, and can be found on display in the Gallery for the next six weeks. There will be an opening reception on Friday at 7 pm. In Toronto at Nuit Blanche on Saturday, we’ll be at the Gladstone for a new projection-based work – No Rights / No Wrongs, which will aim to highlight and articulate a series of indecisive statements on ideas of civic responsibility, community development, and political participation through large-scale projections on the side of the Gladstone. an event that kicks off our 30th anniversary celebrations. There will be three or four dj-s, including Martin ‘Zonk’ Deck, Matthew Hawtin, and Stephen Pender, plus a surpise guest or two. The suggested donation is $4 at the door, which is deposited straight into Artcite’s coffers, and garners you a night of dub, techno, soul, Detroit funk, all good things. Please spread the word, and support local artist-run culture. The Art and Ecology Sidewalk parade is a performance artwork lead by Dr. Jennifer Willet of the School for Arts and Creative Innovation. 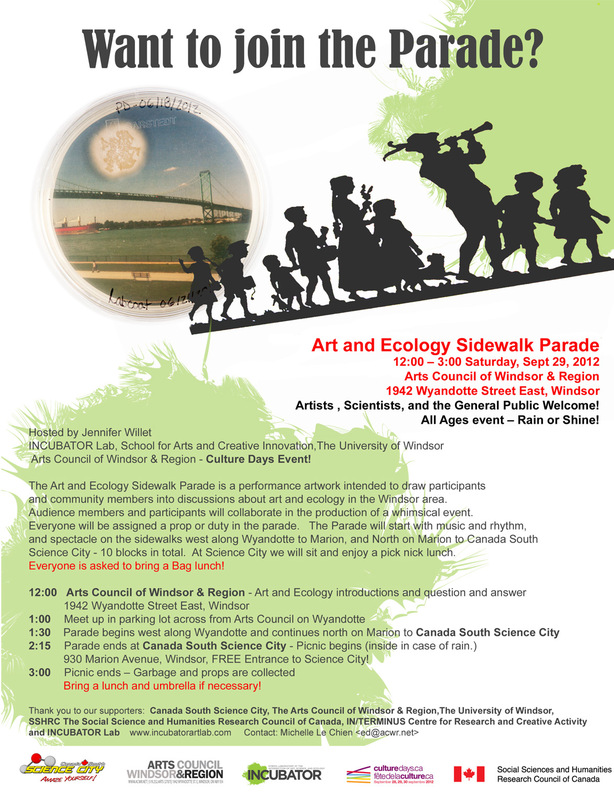 The parade will draw community members into discussion about art and ecology in the Windsor Area with all participants collaborating in the production of a whimsical spectacle involving music and rhythm (10 block walk in total). The event will commence at the Arts Council of Windsor & Region (ACWR) and conclude the Canada South Science City on Marion Street in Windsor, ON. 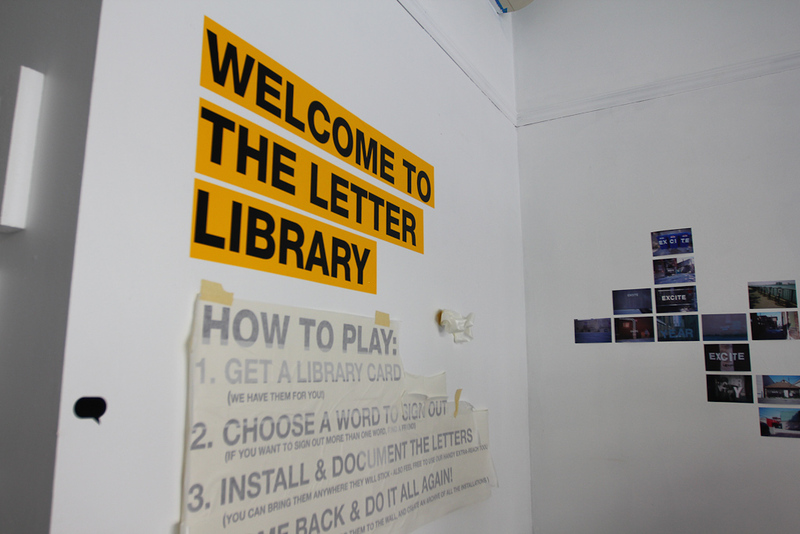 Recap of the Letter Library Opening Event! 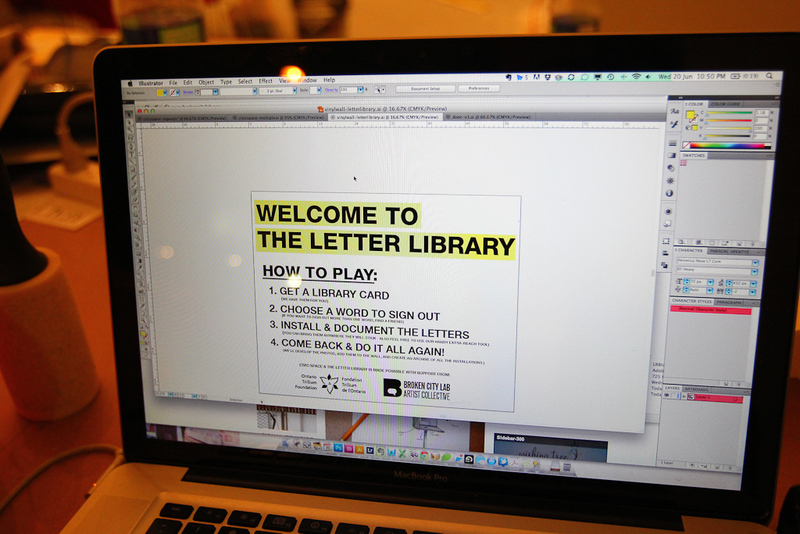 It’s been an incredible few weeks prepping for the launch of CIVIC SPACE and the Letter Library. Huge props to everyone who helped out, especially Kiki Athanassiadis & Lucy Howe! 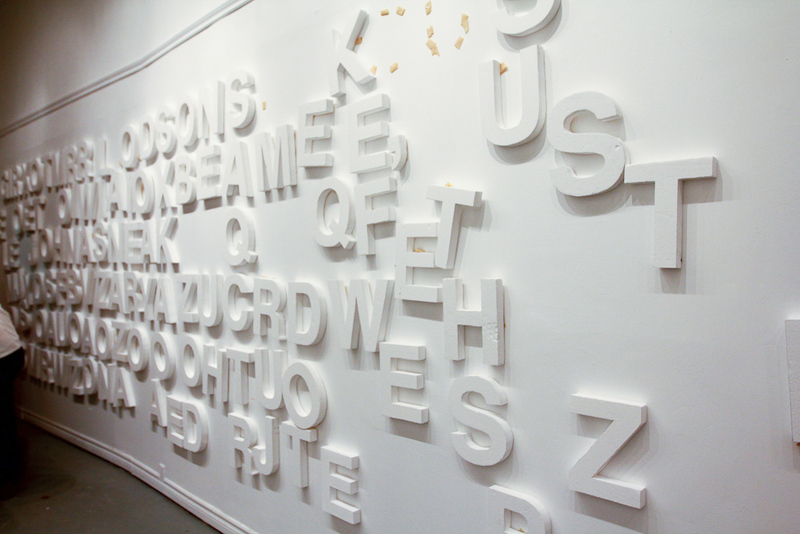 There’s a few hundred letters strewn about the space, waiting for you to takeout and caption the city. 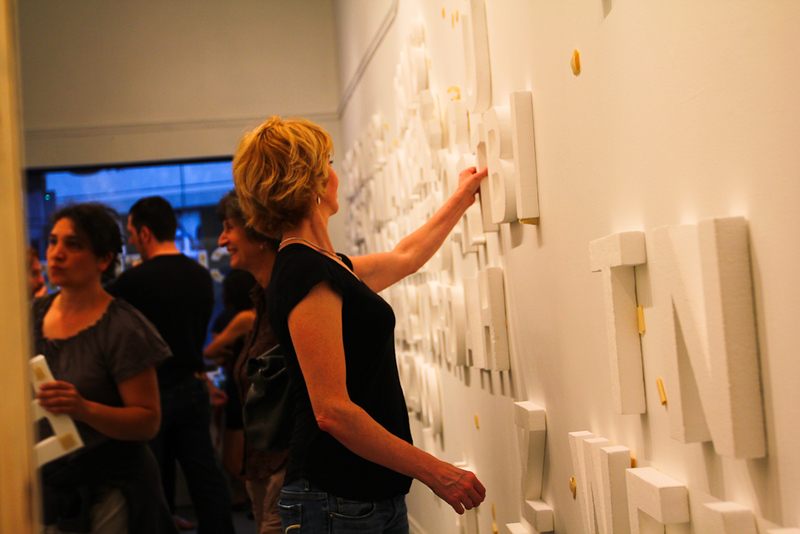 Stop by over the next few weeks — we’re Monday – Friday 11am – 4:30pm + Tuesday-Thursday 7-9:30pm. There’s more information on CIVIC SPACE on the new website too! 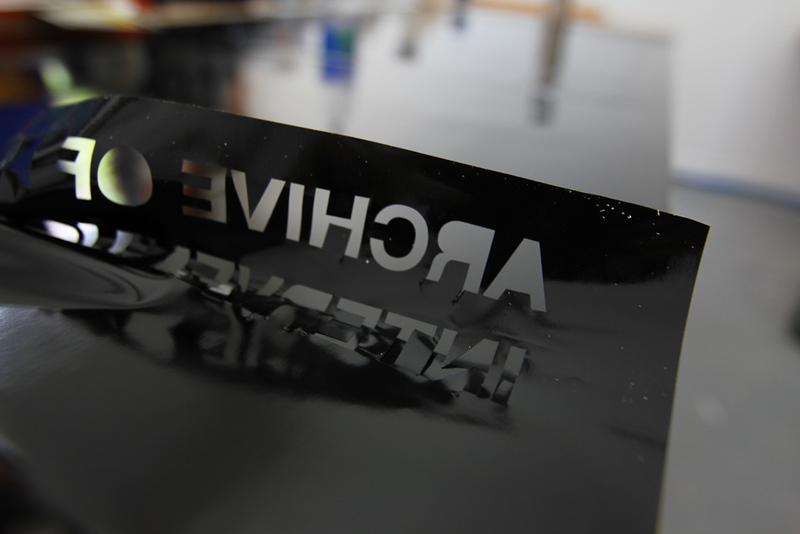 But before a total recap, it’s worth posting on some of the things that came together in preparing for the launch. 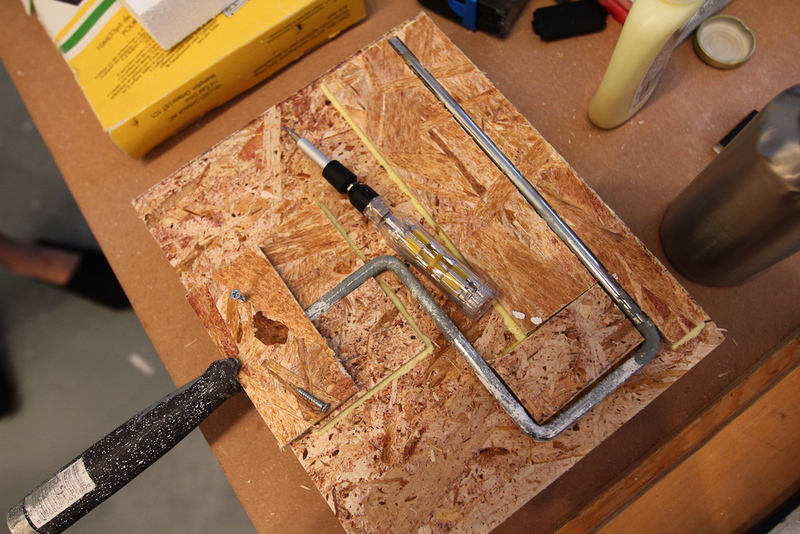 Above, Josh’s extender-tool to reach high places with letters. Hacked together from a lot of spare wood and a paint roller. 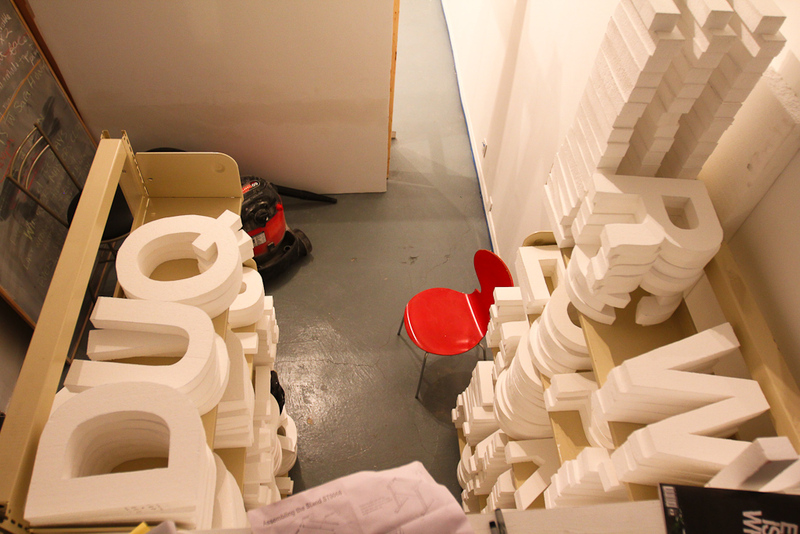 The shelves of letters waiting to be hung. Josh testing the rigidity of his extender tool. And then, a street test. 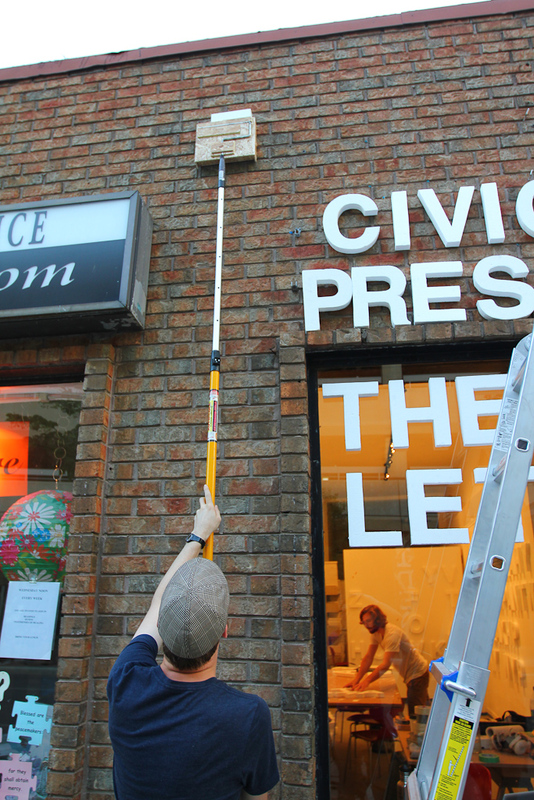 Then, onto installing the more permanent sign on our building … atop the ladder. 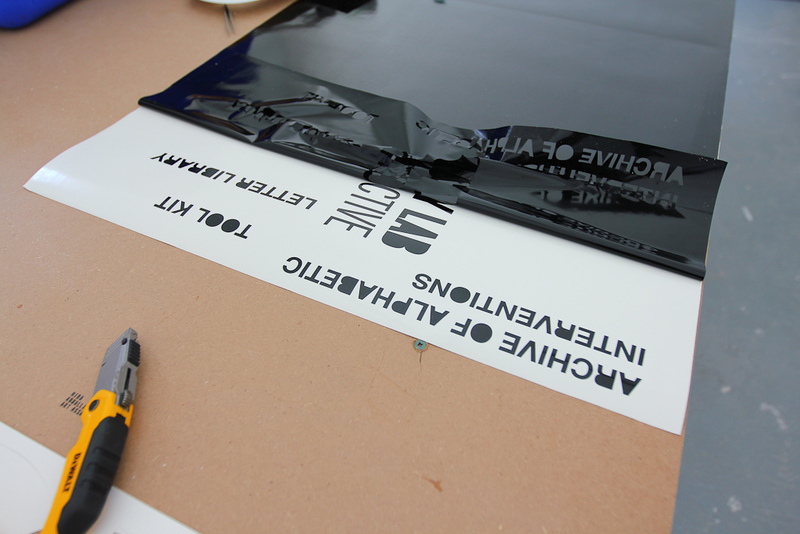 Inside, prepping the file for the vinyl cut. End of the night before the big day. 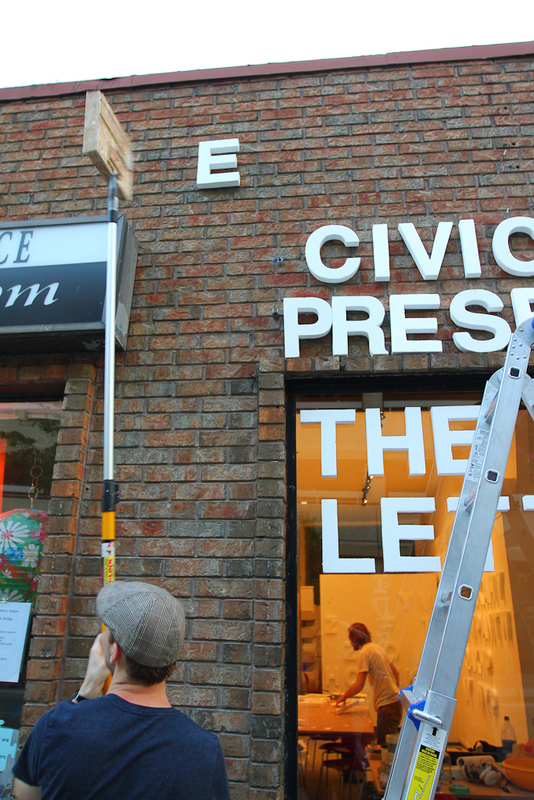 The next morning, Hiba and Rosina head back out to finish installing the sign. 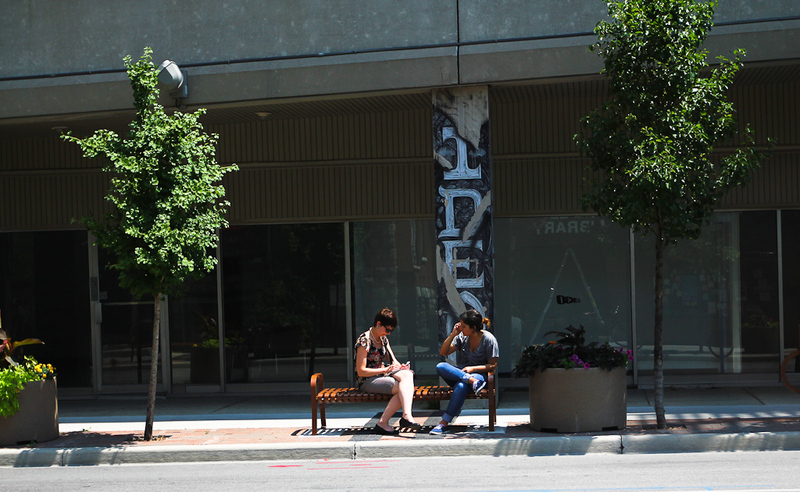 Across the street, Hiba talks to Claire Bronwell. Inside, Rosina works on installing photos for the collage wall. Getting reading to install the vinyl. 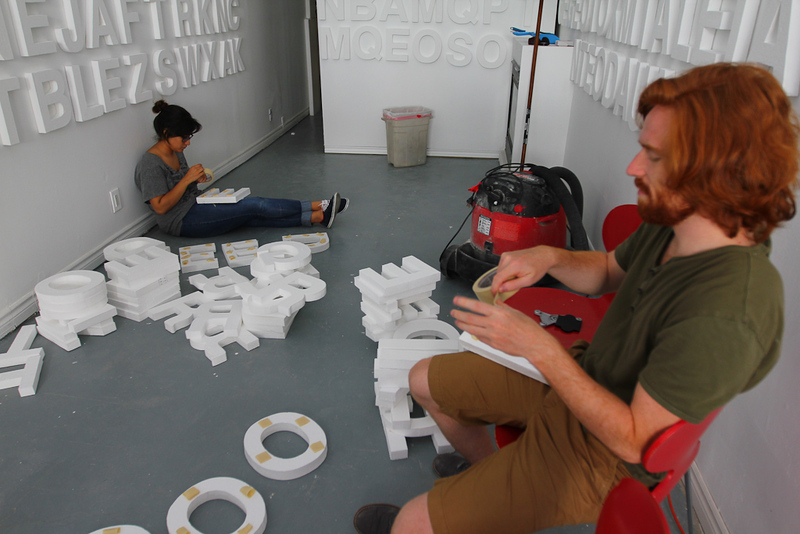 Meanwhile, Hiba, Kevin, and Kiki start mounting the letters on our walls. Ro working on the photo wall. 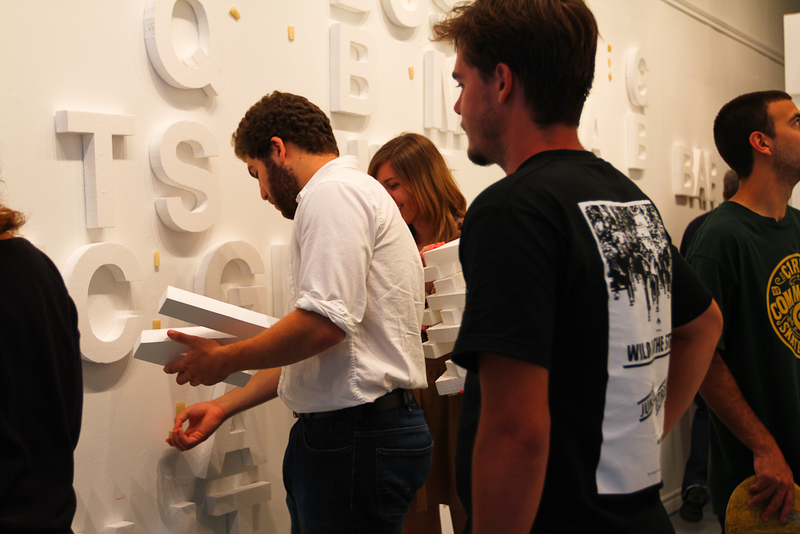 Then, the launch kicks off with letters immediately heading out into the streets. There was an incredible group of people floating in and out all week. We’re excited to get the photos back once the rolls are finished off. Entering the space from our front door. 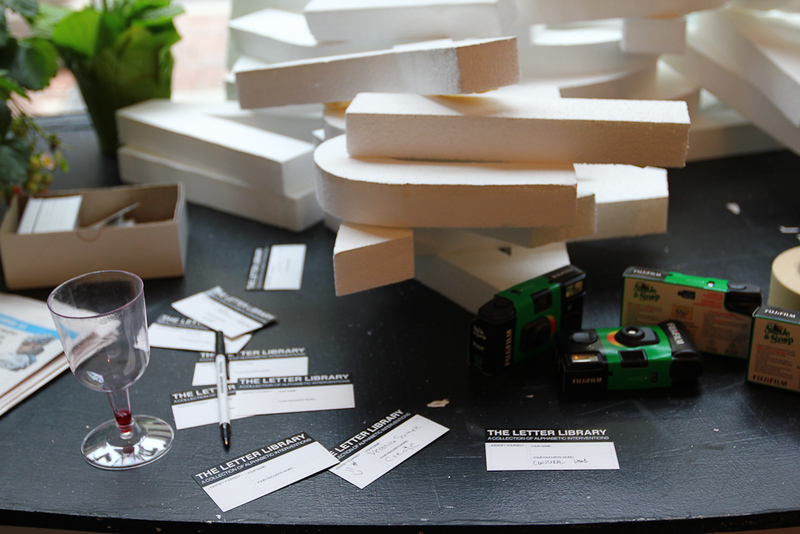 Piling letters before heading out. 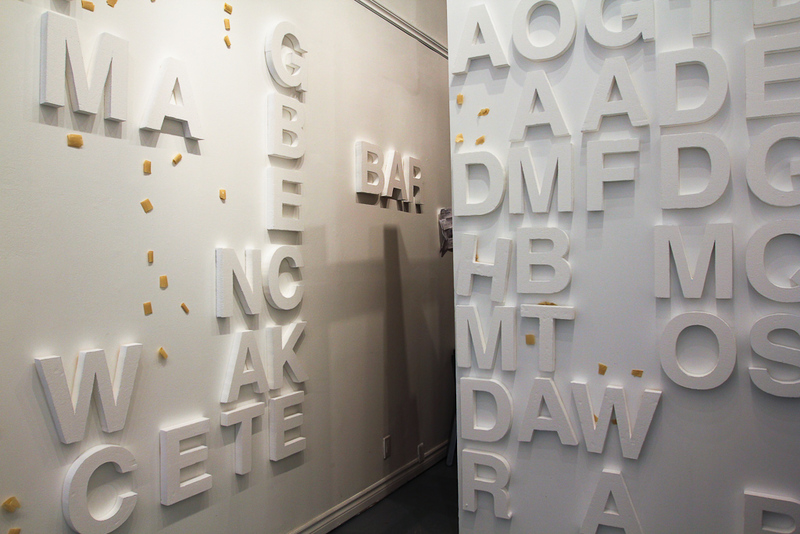 Then, Hiba puts the returned letters back up. 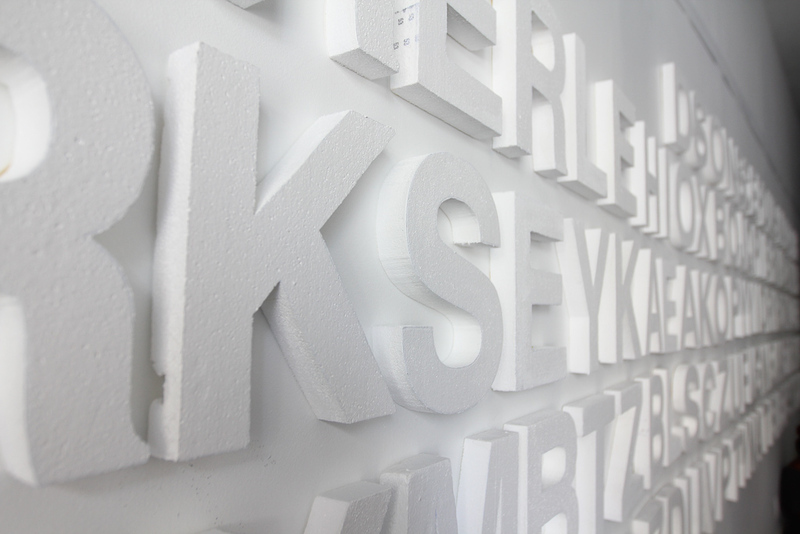 The letter wall, as people bring back their letters. Last install of the evening. Huge thanks to everyone who came out for our first event. As the rolls get finished, we’ll be installing them on the wall and posting them on the site. 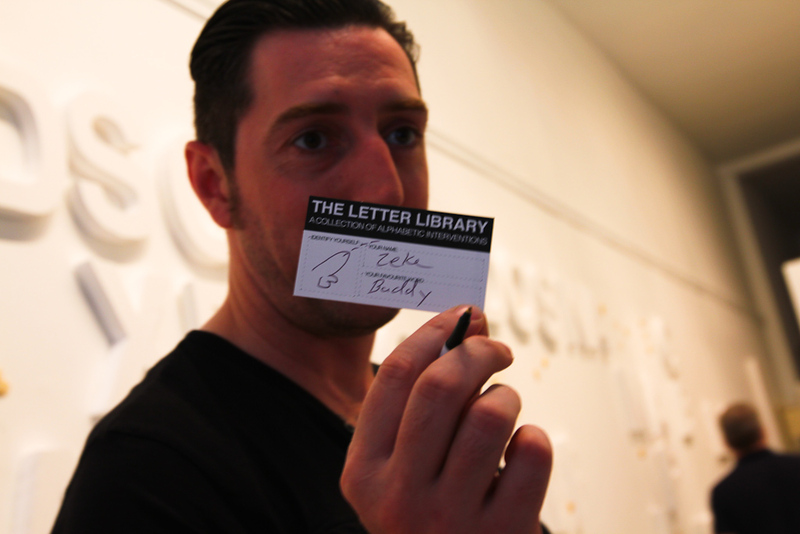 And, remember, the Letter Library is still open. If you’re in the neighbourhood stop by! More soon, but first, a weekend to recover. For more information on CIVIC SPACE and its programming: please visit civicspace.info. We’re incredibly excited to announce a new initiative that will become the centre of our focus for the next two years. 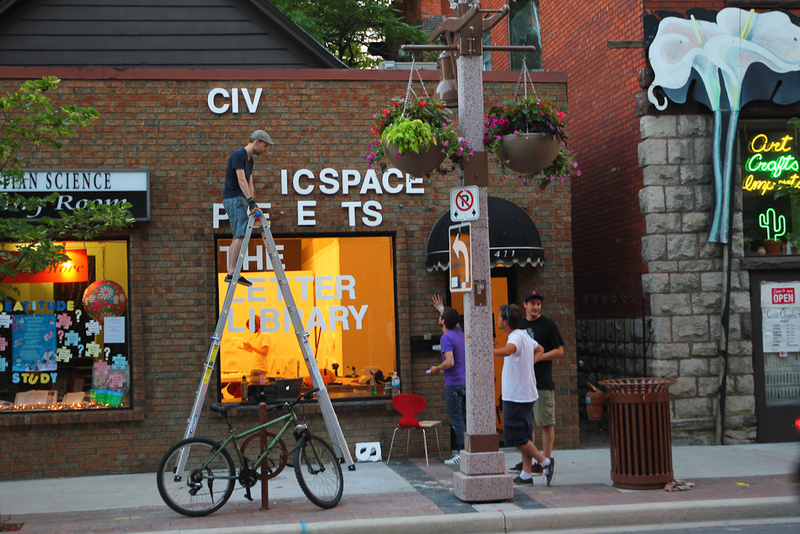 CIVIC SPACE (Community Innovation through Vital Interaction & Collaboration Space) will launch on Thursday, June 21st at 411 Pelissier Street in downtown Windsor. 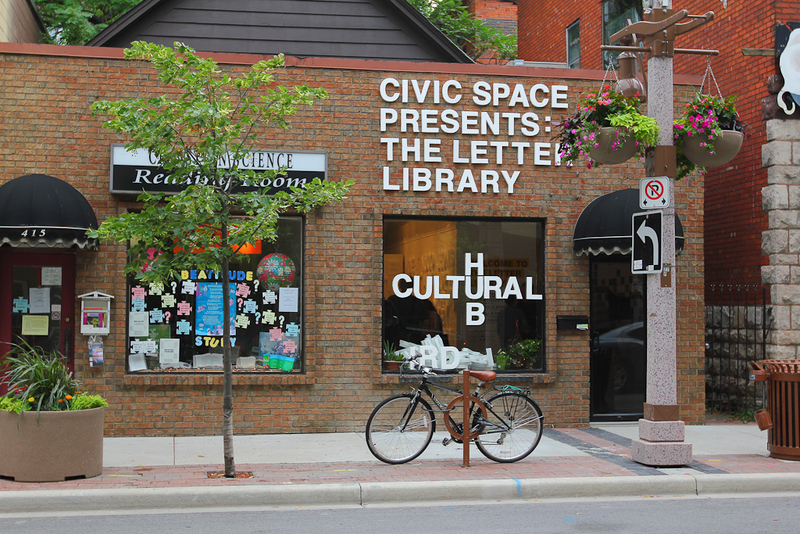 Supported by the Ontario Trillium Foundation, CIVIC SPACE will serve as a hub for our events, public activities, and research around locality, infrastructure, education, and creative practice as a driver for civic change. This storefront space (once a textile store and before that a jeweller) will soon host new community projects, artist residencies, DIY workshops, public lectures and a range of other new initiatives for the next 24-months. CIVIC SPACE will aim to engage the public in addressing community challenges through new programming and activities that initiate collaborative creative problem solving. 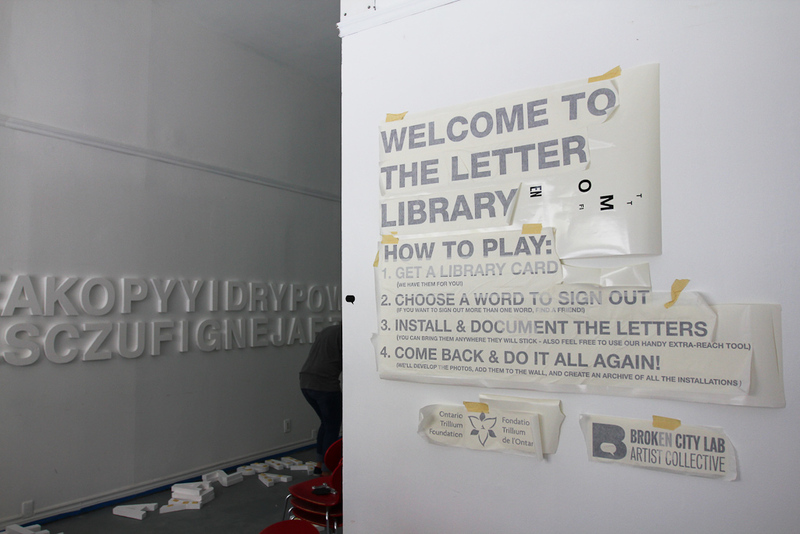 On June 21st at 7pm, we’ll be kicking things off with the Letter Library (A Collection of Alphabetic Interventions). 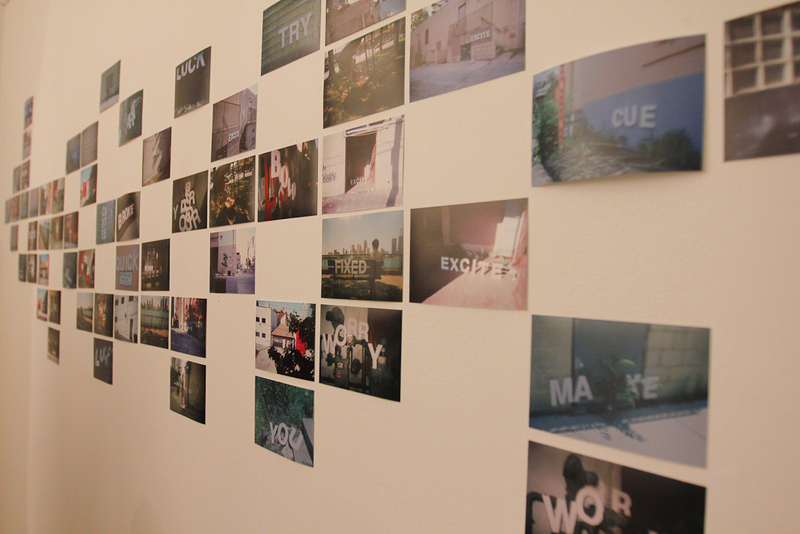 This open community project invites anyone and everyone to come borrow from our letterset to caption the city around them. 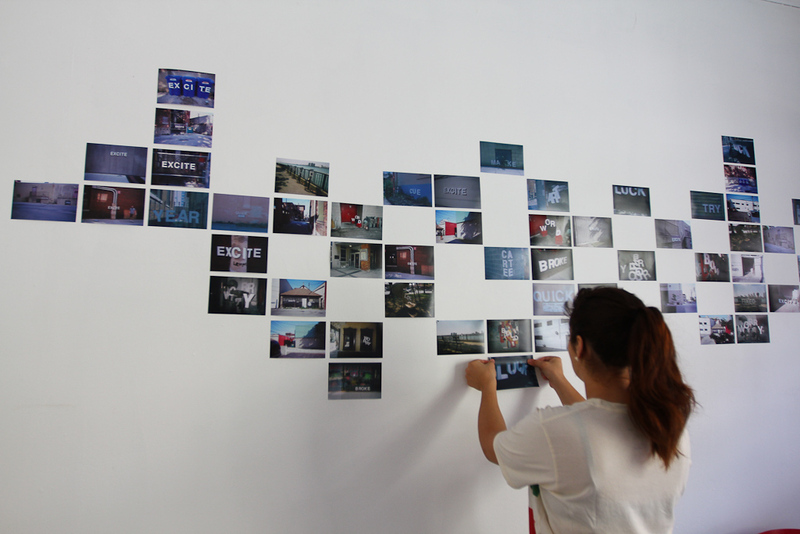 With Windsor at the edge of so many transitions, how might we collectively reclaim and create our own public narratives about the future of our city through this playful intervention? 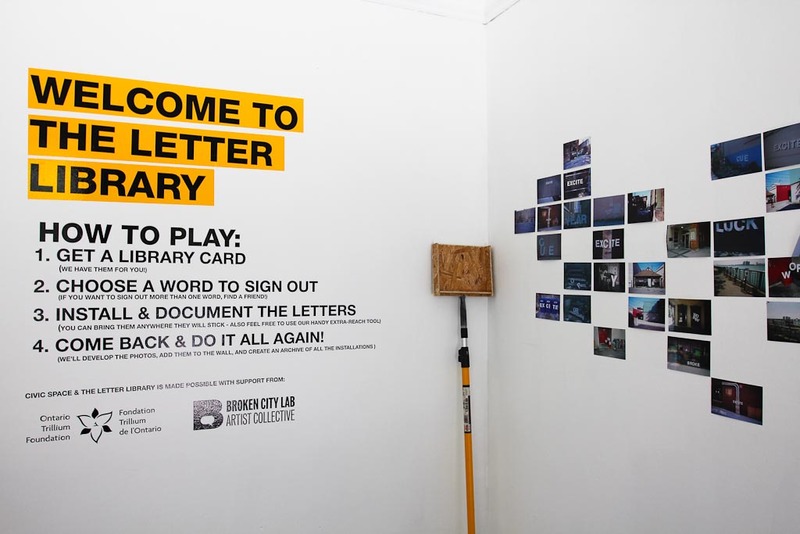 Anyone participating will be issued a Letter Library Card and will able to sign out 12″ 3D letters from our collection to create their own temporary installation, document it with one of our single-use cameras, and ultimately help to build an archive of new captions for the city’s build environment. 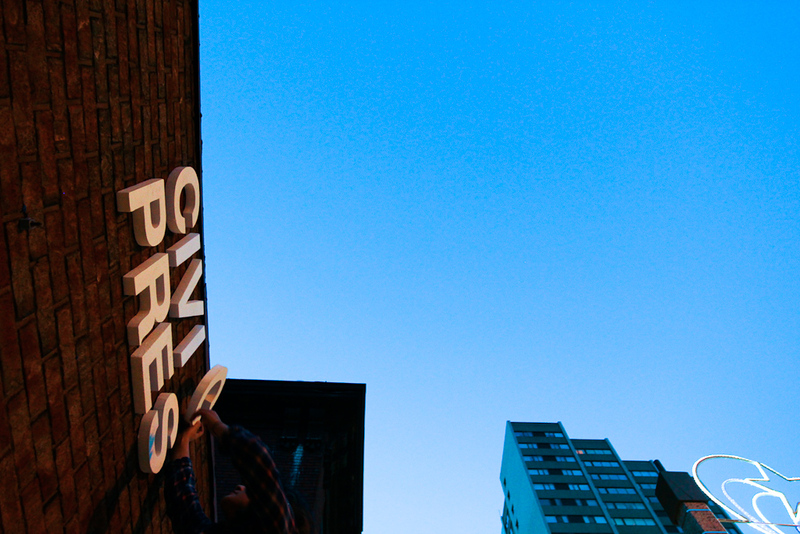 We’ll also be announcing the rest of our summer programming very soon … stay close. CIVIC SPACE would not be possible without the incredibly generous support from the Ontario Trillium Foundation. P.S. If you’re interested in applying for a residency, looking to connect for a new collaborative project, or just interested in (finally) making the trip to Windsor, be in touch.